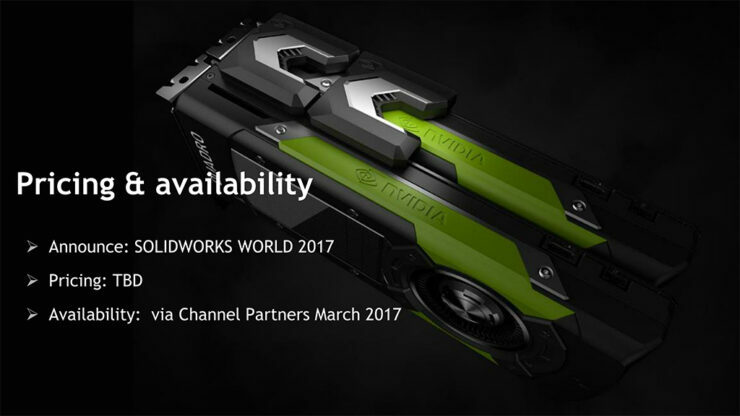 NVIDIA has announced their entire Quadro Pascal lineup today, at the SOLIDWORKS World annual trade show. 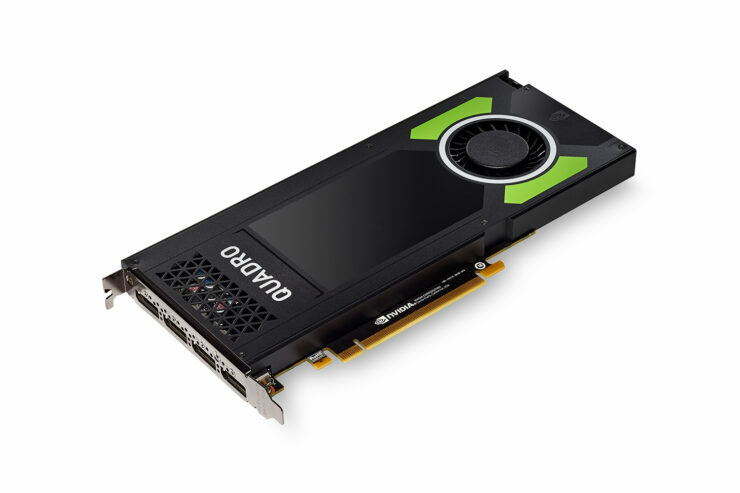 The new lineup features a mix of Pascal based Quadro graphics cards along with the flagship Quadro GP100. 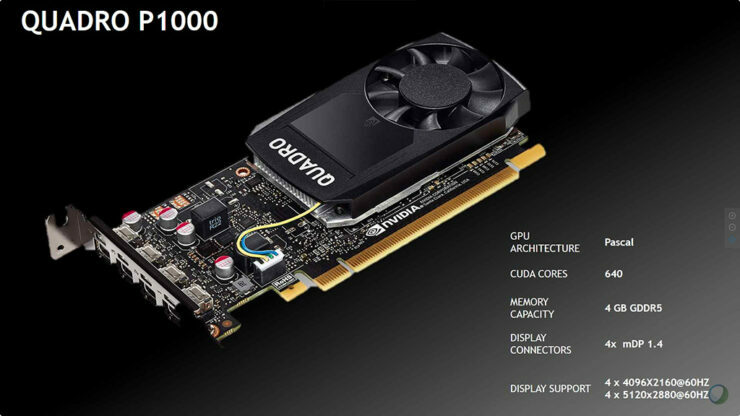 The Quadro GP100 is the closest thing we could get to a consumer-level graphics card with the GP100 GPU. 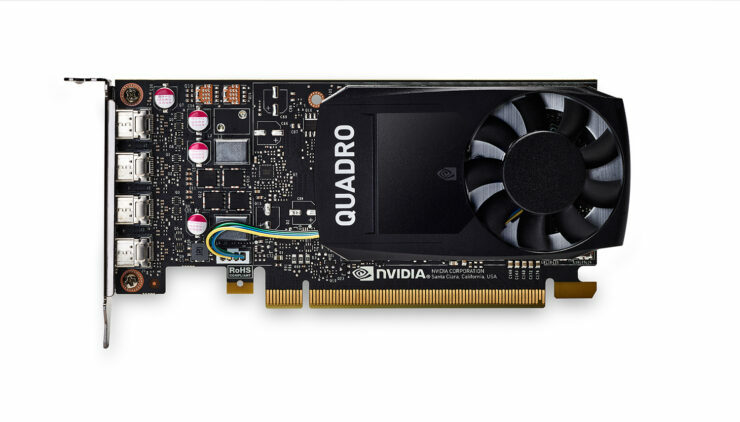 It’s still cratering the compute heavy users and would come at a significant price over the GP102 GPU based Quadro P6000. 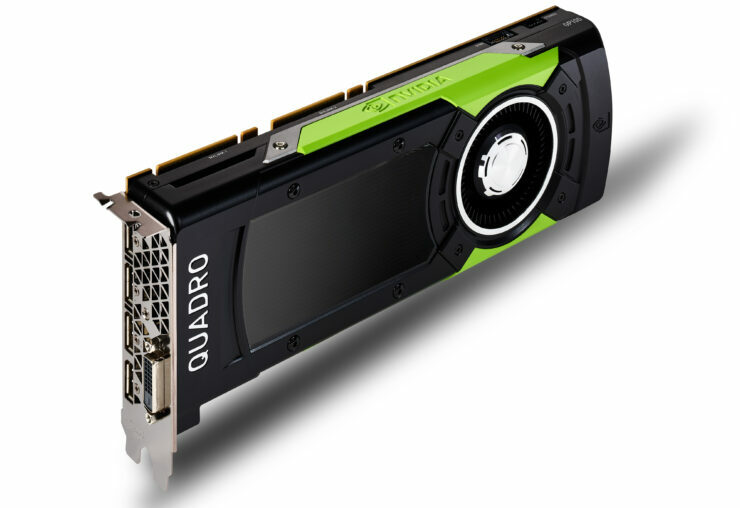 The Quadro GP100 is also the first instance of many technologies coming close to the consumer front in the form of HBM2, NVLINK and over 20 TFLOPs of half-precision compute. The card will be aimed at users who demand the best performance in the most demanding rendering and GPGPU compute applications. Unify simulation, HPC, rendering and design – The GP100 combines unprecedented double precision performance with 16GB of high-bandwidth memory (HBM2) so users can conduct simulations during the design process and gather realistic multiphysics simulations faster than ever before. Customers can combine two GP100 GPUs with NVLink technology and scale to 32GB of HBM2 to create a massive visual computing solution on a single workstation. Explore deep learning – The GP100 provides more than 20 TFLOPS of 16-bit floating point precision computing, making it an ideal development platform to enable deep learning in Windows and Linux environments. 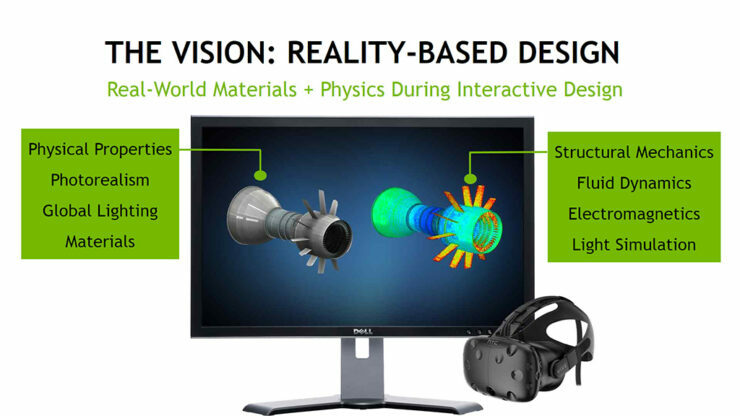 Incorporate VR into design and simulation workflows – The “VR Ready” Quadro GP100 and P4000 have the power to create detailed, lifelike, immersive environments. Larger, more complex designs can be experienced at scale. 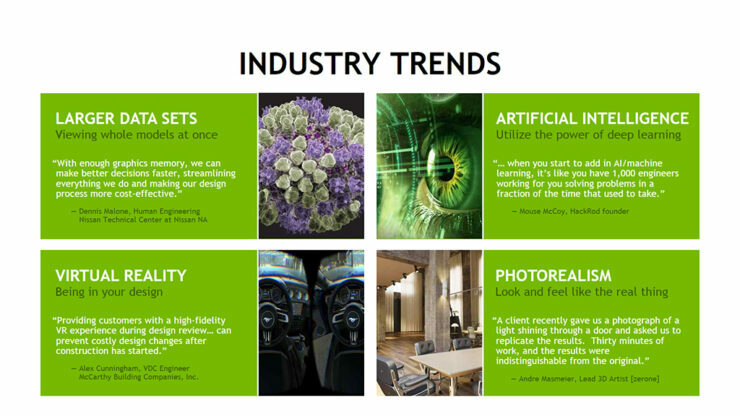 Reap the benefits of photorealistic design – Pascal-based Quadro GPUs can render photorealistic images more than 18 times faster than a CPU. Create expansive visual workspaces – Visualize data in high resolution and HDR color on up to four 5K displays. Build massive digital signage configurations cost effectively – Up to 32 4K displays can be configured through a single chassis by combining up to eight P4000 GPUs and two Quadro Sync II cards. 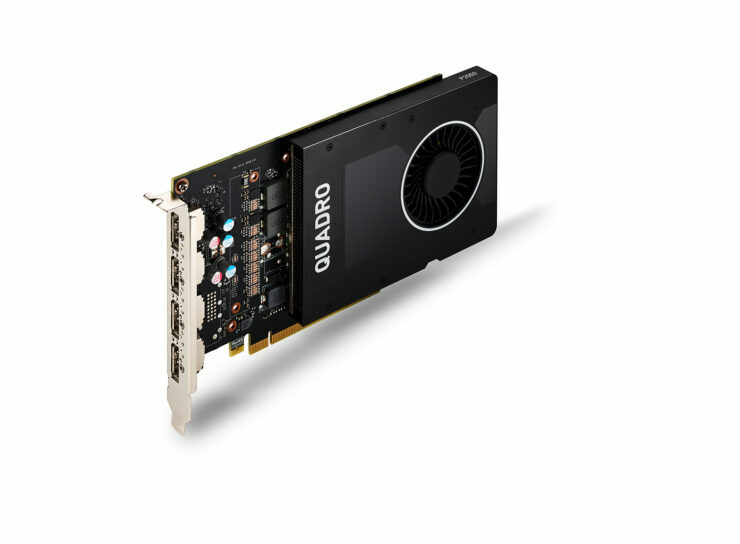 The GP100 GPU is composed of an array of Graphics Processing Clusters (GPCs), Streaming Multiprocessors (SMs), and memory controllers. The chip achieves its colossal throughput by providing six GPCs, up to 60 SMs, and eight 512-bit memory controllers (4096 bits total). The chip has been specifically designed for the compute market and it serves a great deal of performance in this sector. 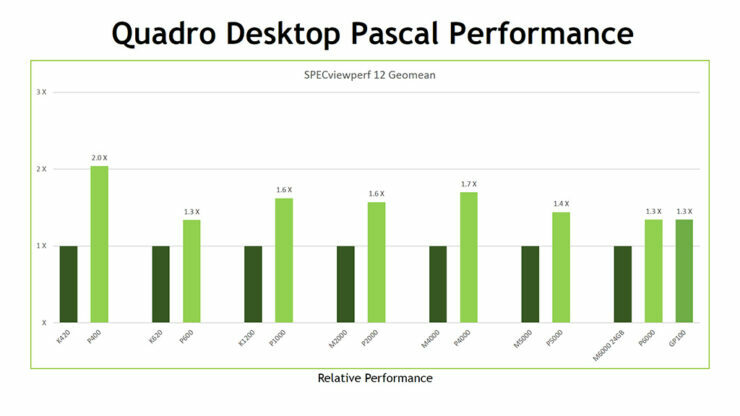 The Pascal architecture’s computational prowess is more than just brute force: it increases performance not only by adding more SMs than previous GPUs, but by making each SM more efficient. 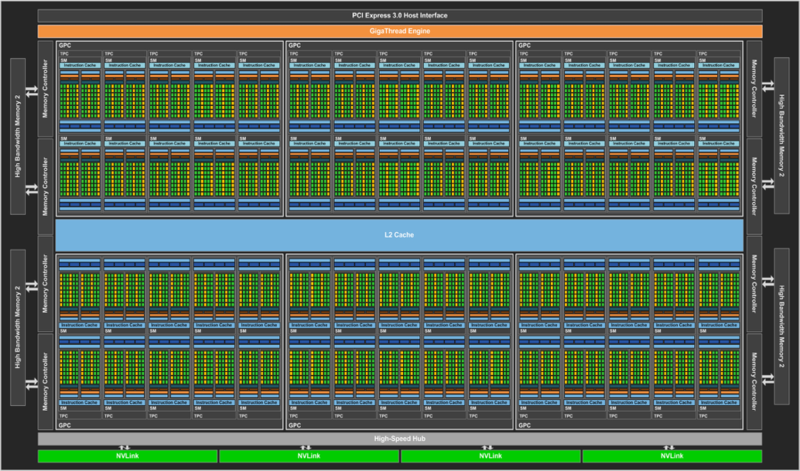 Each SM has 64 CUDA cores and four texture units, for a total of 3840 CUDA cores and 240 texture units. These SM units have been arranged into 32 TPCs comprising of two SMs. Because of the importance of high-precision computation for technical computing and HPC codes, a key design goal for Tesla P100 is high double-precision performance. Each GP100 SM has 32 FP64 units, providing a 2:1 ratio of single- to double-precision throughput. Compared to the 3:1 ratio in Kepler GK110 GPUs, this allows Tesla P100 to process FP64 workloads more efficiently. 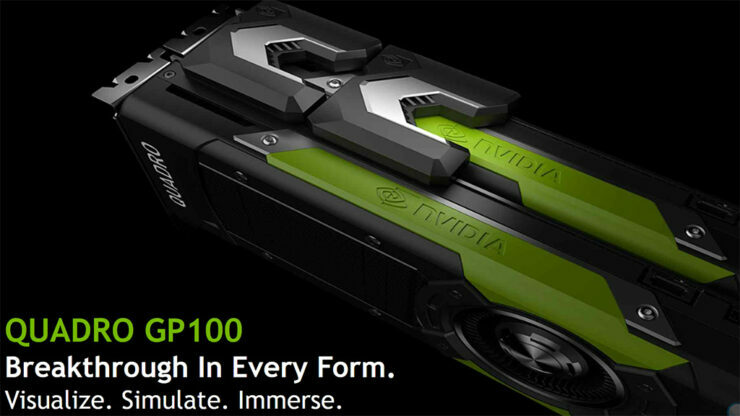 For more information and details on GP100 GPU, you can read our article here. You can also find performance benchmarks of the GP100 GPU here. The GP100 GPU packs four stacks of HBM2 memory. The total VRAM featured on this chip is 16 GB which is currently the highest amount of HBM2 memory featured on a card. 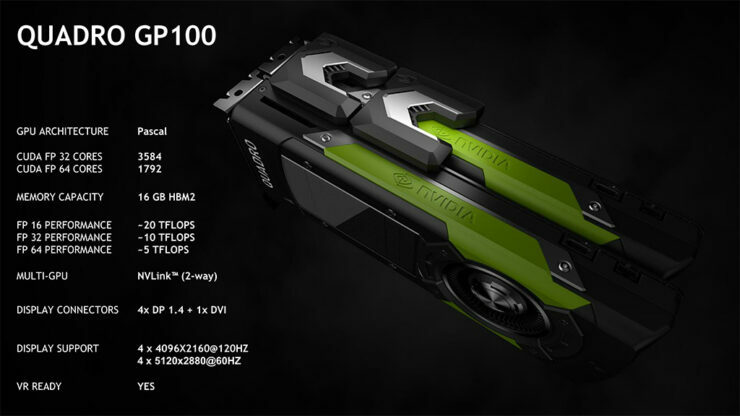 The GP100 GPU is the first chip to utilize the new HBM2 standard since its launch in Q2 2016. The chip features 720 GB/s bandwidth which is higher than the 432GB/s for Quadro P6000. 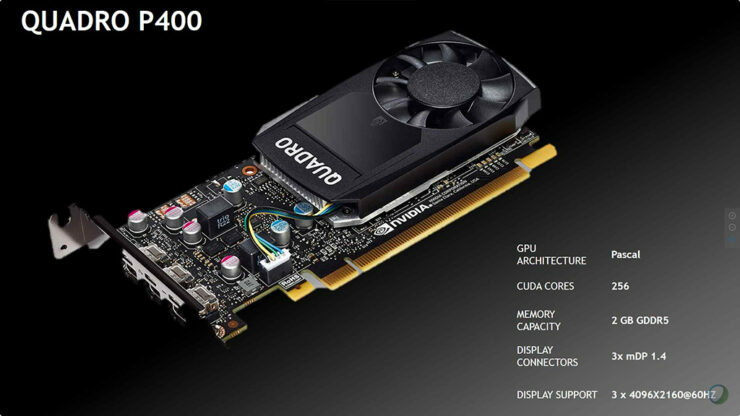 The most impressive thing for the Quadro GP100 is its new NVLINK interface. 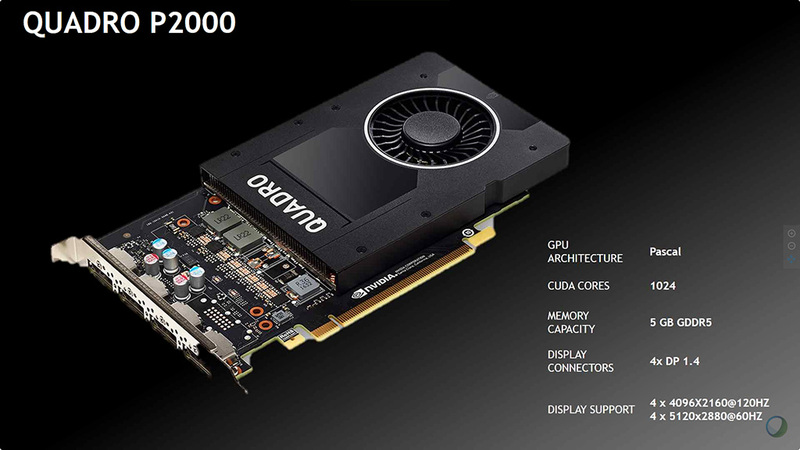 This is the first instance of the new technology on PCIe graphics cards. Even the Tesla P100 PCIe variants don’t feature this technology. 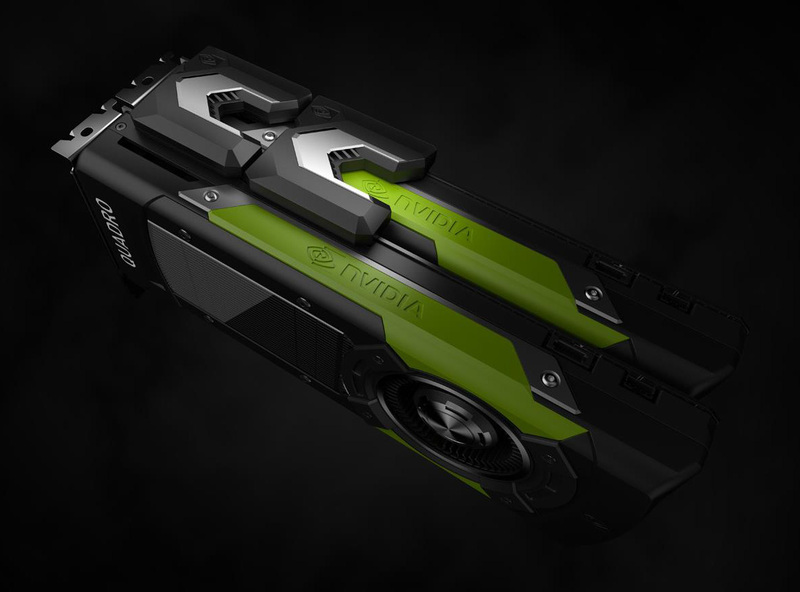 It uses a new interface which is proprietorially developed by NVIDIA for their NVLINK enabled cards. Two large connectors can be found on the sides of the GPU’s PCB, longer in length than a regular SLI connector. These cards support 2-Way NVLINK connectivity which allows users to take advantage from memory pooling (16 GB Plus 16 GB) for a total of 32 GB HBM2 VRAM access and lower latency data transfer speeds. In terms of display capabilities, the card features four DP 1.4 ports rated to operate at 4K @120 Hz and 5K @ 60 Hz. There’s also a single DVI port and of course, the card is VR Ready since its main focus is on tasks that are aimed at the VR market too. 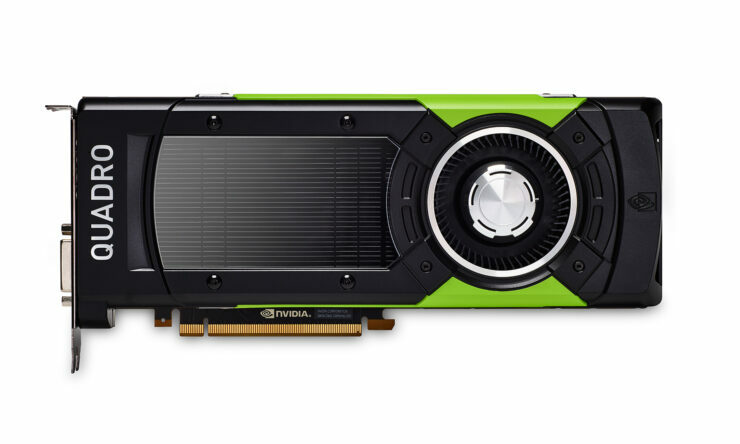 NVIDIA has also announced five new products in the Quadro lineup. 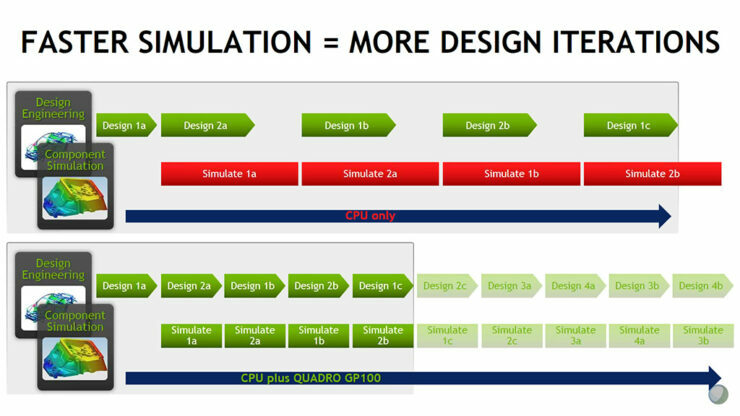 All new cards will utilize the latest Pascal architecture and replace older Maxwell based cards. 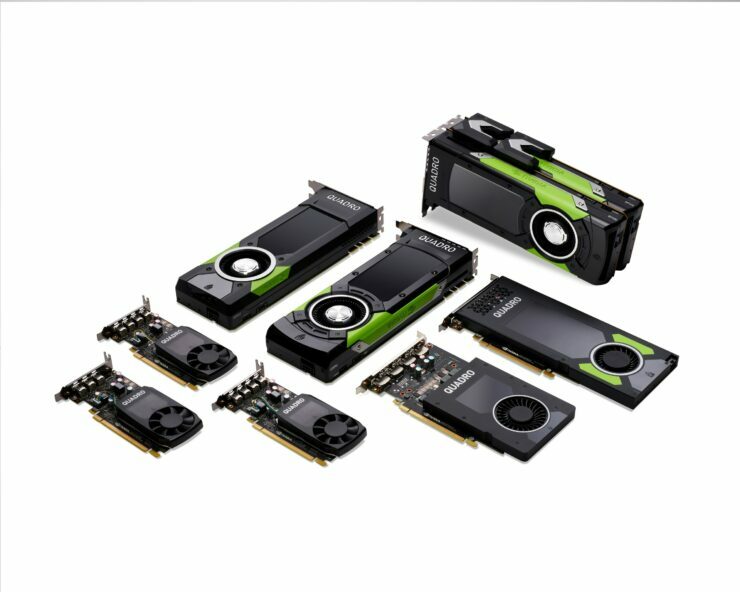 They are based on a range of Pascal GPUs and will have various price and performance tiers. The Quadro P4000 replaces the older Quadro M4000 graphics card. It comes with the new 16nm GP104 GPU core that houses 1792 CUDA Cores and 8 GB of GDDR5 memory. The memory runs along a 256-bit memory bus interface and comes with 256 GB/s bandwidth. 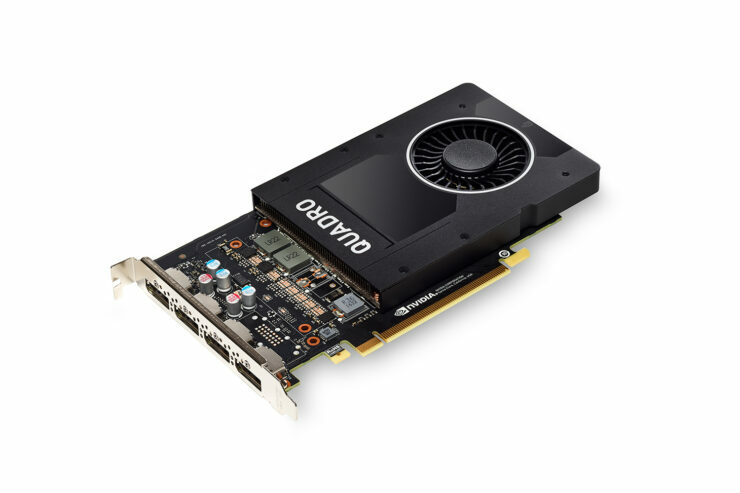 The total compute power for this card is rated at 5.3 TF (Teraflops) and comes in a single slot package. The TDP of the card is rated at 105W so power is fed through a 6-pin connector. There are four DP 1.4 connectors on the card. The card should theoretically deliver up to 2x the performance of its predecessor while consuming 15W less power than the Maxwell core. 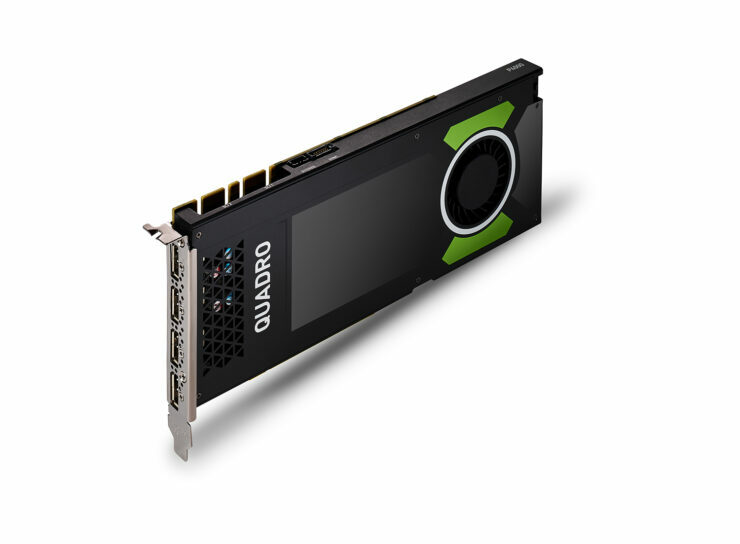 The Quadro P2000 is replacing the Quadro M2000 with the new GP106 graphics core. 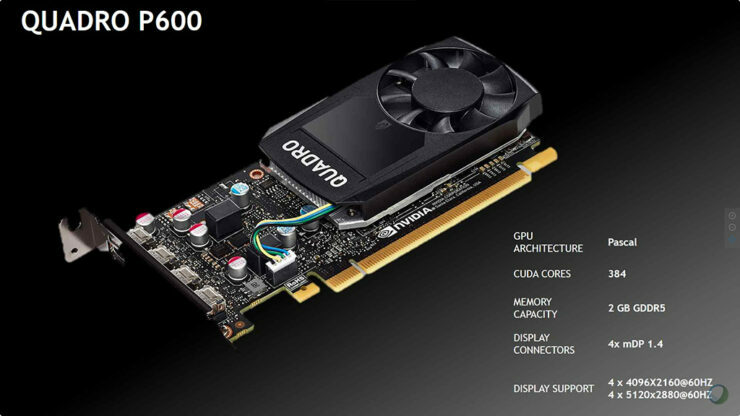 The card features 1024 CUDA Cores and 5 GB of GDDR5 memory. The card uses a 160-bit bus interface due to its unusual 5 GB of VRAM. There’s also 3 TFLOPs of computing power on this card and a rated TDP of 75W. Quadro P2000 also comes in a single-slot package with four DP 1.4 connectors. 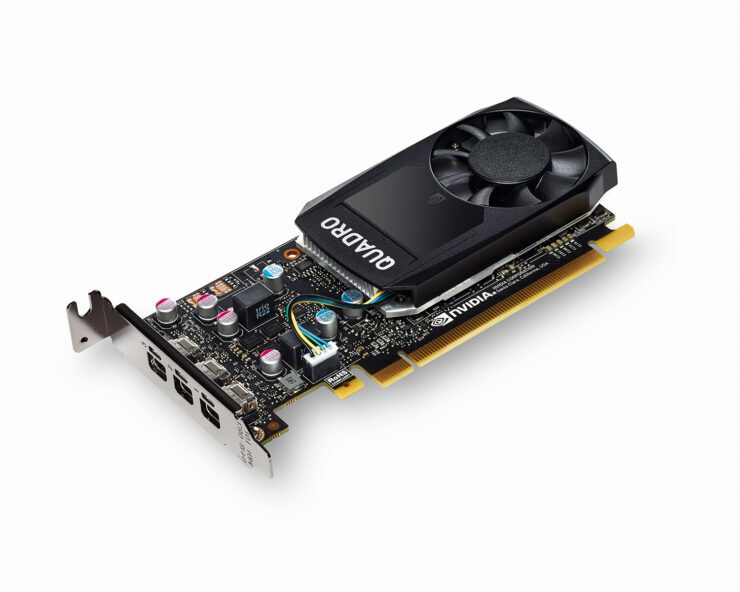 No power input is required since the card gets its power input directly from the PCIe slot. Performance is rated up to 60% faster than its predecessor. 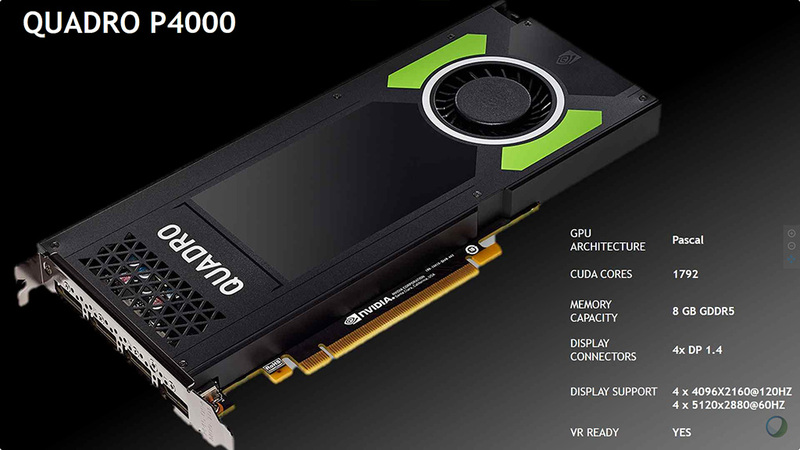 Next up, we have the Quadro P1000, P600 and P400 products, all of which are based on the 14nm GP107 GPU core. The core configs for these variants are 640, 384 and 256 while the memory config is 4 GB, 2 GB and 2 GB GDDR5, respectively. The cards feature 1.8 TFLOPs, 1.1 TFLOPs and 0.6 TFLOPs of compute performance, respectively. All cards come in low profile form factors with TDP less than 50W. The Quadro P1000 and P600 feature four Mini DP1.4 connectors while the P400 features only three display ports. 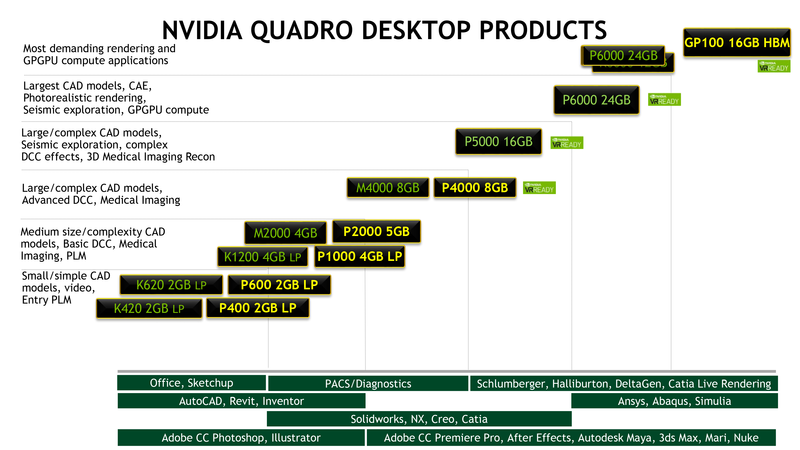 The new Quadro products will be available starting in March from leading workstation OEMs, including Dell, HP, Lenovo and Fujitsu, and authorized distribution partners, including PNY Technologies in North America and Europe, ELSA/Ryoyo in Japan and Leadtek in Asia Pacific.